I would like to thank our enthusiastic and energetic host Julia Vysotska for inviting me to judge the informal tournament for the first four months of 2014. 62 problems by 43 authors from 22 countries took part in this fairy informal tournament. I also considered the versions published in the comments and the originals from the highly instructive article published by Juraj Lörinc. This article actually shows very well the various challenges of chess composition, starting from the idea and ending by selecting the best presentation form. The help-play stipulations have been better represented with 35 helpmates and 17 helpselfmates compared to 3 direct mates, 3 serial problems, 3 helpstalemates and 1 selfmate. Dealing with a so heterogeneous distribution of stipulations is always challenging for a fairy judge, so I eventually split the award in two sections based on the number of pieces: 29 miniatures vs. 33 non-miniatures. Fortunately enough, the quality of entries in both sections was balanced enough to support this decision. Now more words about the criteria I use in ranking the compositions. I discarded the problems which are not original enough, or have constructional defects such as bad economy, technical [fairy] pieces, repetition of moves, insufficient fairy density or even lack of interplay. After the elimination phase, the remaining problems have been assessed like in figure skating for the technical merit and the artistic value of presentation. Of course, this part of the evaluation is highly subjective and some composers and judges might have different tastes. 476 is anticipated by A. 512 is anticipated by B. 535 is totally anticipated by Mikitovics’s comment published in 476. A very curious and highly unfortunate case! One of the strongest candidates for being rewarded was 493 (Harris). In spite of the repeated white move and the usage of Transmuted Kings applied solely to black King in the first solution, I was tempted to include this composition for the original combination of the fairy conditions. But this problem pales compared with the magnificent C! It is rather unusual to have an initially empty board in fairy compositions! 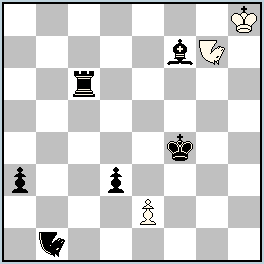 Most of such problems have been composed by Peter Harris himself and require adding an initial piece on the board in order to reach to a certain stipulation – usually featuring Republican Chess. The theoretical question that bothered me is related to the interpretation of Maximum fairy condition. The length of a move is considered as the distance between the start and arrival square. It is important to note that without this rule, the length of a Rose move could be debatable and an Ubi-Ubi movement will become non-deterministic. While this rule is generally accepted as is, it might raise other interesting questions related to the meaning of “arrival square” when Maximum is combined with conditions involving the rebirth of moving piece, such as Take&Make or AntiCirce. Considering the arrival square just the final result of all the applied fairy conditions, 491 would definitely have no solution! Why? 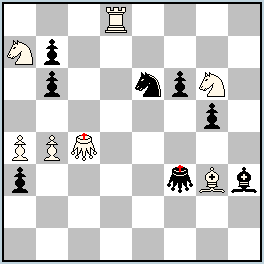 Because the move 5…Ra7xh7=bQ[Qh7d8][+wPa7] is not the longest possible white move. The conditions are cleverly mixed and all of them are actively used in the unique solution. Some conditions are actively employed in almost every halfmove, while others are more discreet. It requires a lot of imagination and fantasy to think of such a combination of fairy conditions! However the restrictive stipulation “1 solution” hinders a higher classification. I think a presentation with the wK already on the board would have been better. Nowadays we need to have more such didactic problems published in the fairy columns! This one is an excellent composition to explain newcomers about Marine Knight properties. Both pieces open the lines for white officers. The first Marine Knight performs a selfblock, but in the same time puts a guard on the mating square (AntiZiel element). 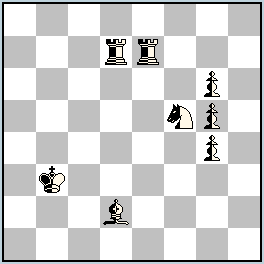 Hence the second Marine Knight moves to a square where ensuring the white mating figure is immune. The idea is not new, as it has been shown using Locusts instead of Marine Knights, but it the presentation is convincing, with both white and black pair of figures exchanging their roles. Alas, bPc4 is useless in one solution, but this doesn’t detract the strong positive impression. 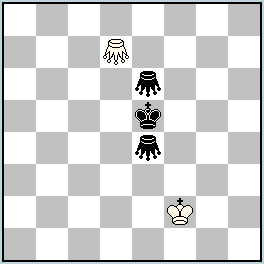 The three spectacular active sacrifices of Ariadna – the Marina Princess – allow the black Poseidon to surprisingly get out from the corner, where is mated by three different white pieces on different lines. Moreover, all solutions are unified by having the introduction move played by the same piece: the black Triton. Is it worth defining a new fairy unit instead of an existent one? While I agree three solutions are generally a better presentation than twins, in this particular case the usage of Marina Princess seems rather technical. Although this view might be seen rather too dogmatic by certain composers, I believe the employment of fairy pieces where orthodox pieces can be used is a defect. 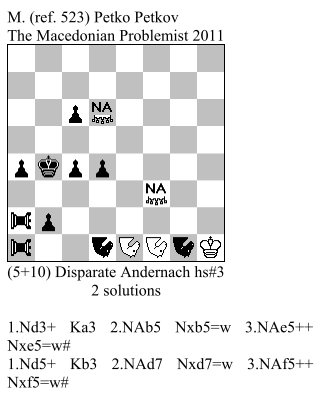 As an example, in 486 by the same composer there is no need to have SuperPawns: two black Rooks on d1 and b7 would suffice. Years ago, a neutral AUW would have ensured a high place in the Wenigsteiner of the Year. Nowadays it seems this quality didn’t even ensure the problem the qualification on the shortlist of candidates for 2014 competition! We have not only an AUW, but also mutual captures between the neutral pawns realized thanks to ingenious and rather intensive usage of both fairy conditions by both sides. 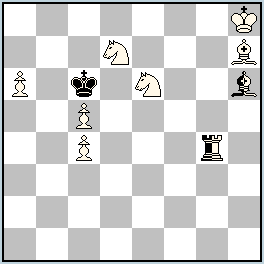 Some purists might deplore the mate in a) uses a double check, while in b) is a single check, but the twinning moving the white King is quite subtle compared with other realizations. A problem raising high the quality standard for future neutral AUWs in h#2 form! 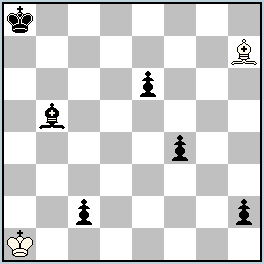 Passive promotions in Locust of both white and black pawns, after impressive SuperCirce play! 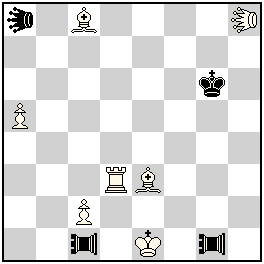 The diagonal-orthogonal correspondence is particularly striking in the first black move: the white pawn is captured diagonally in a) leading to an orthogonally self-pinned black Locust, while in b) the white pawn is captured orthogonally and the black Locust is diagonally selfpinned. The last move show a nice pas-de-deux played by both Kings, ending with the black Locust sandwiched between the two white Locusts, in a very curious spiking position. An excellent composition which shows an exemplary mastery of employed fairy conditions and a huge step forward compared with single-line D. The readers must carefully read the detailed explanations provided by the author in order to fully enjoy the contents. A Helpmate Of The Future with diagonal-correspondence in tanagra is definitely an achievement deserving high recognition! 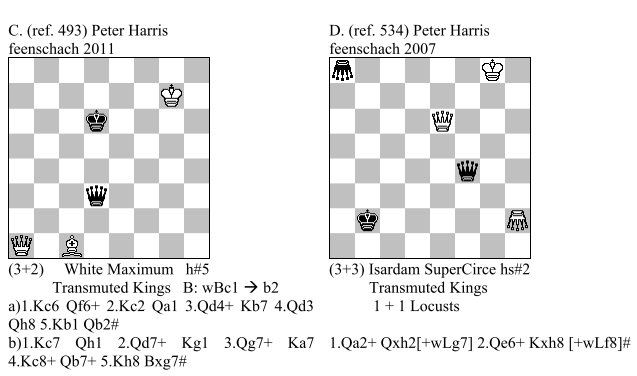 Like in the 2nd HM, the mates exploit Isardam condition in the final position, spiking the black King between the two Grasshoppers. Again the economy is flawless. Though only one solution features interplay, overall we can see certain progress has been made from previous realizations (see E). An exceptional artistic composition, typical for high standards of the Slovak chess composition school! All three top prizes feature compositions having three fairy conditions. These may be view as too many for conservative tastes, but what a wealth of unexpected effects is unleashed! I applaud the authors for their initiative and creative thinking. It is worth studying in slow motion the solutions in order to understand why certain move works and others don’t. This apparently innocent looking AUW with three fairy conditions actually hides a very subtle obstructions theme. The seemingly useless moves to own rebirth squares in Mars Circe are motivated by the need to subsequently block these squares after the final capture. Please note the promotions in nB and nS are specifically motivated by the need to preserve the check to white King, as the very attentive commentators rightly spotted. In spite of the single PWC effect in each solution, the unified contents and the perfect presentation in two solutions raise the problem on the podium. Chris eventually succeeded to show more PWC effects with reversed order of promotions using an entirely different matrix (see F), but the unique charm of 521 is definitely lost. 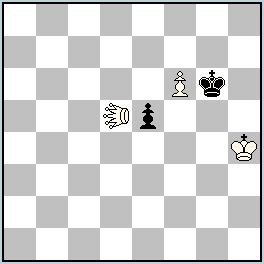 Deceptively simple starting position: one white King, one black King, one black Pawn and three fairy conditions shown before together only by Peter Harris (not only in 491). Usually one can expect a single solution with some interesting effects using this material, or even two – when the composer is lucky, but three?! In all solutions the rebirth square of white King must be guarded. 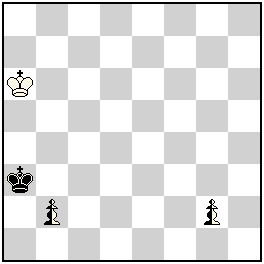 In a), white must guard e8 before occupying e1 with the promoted Queen. Surprisingly, the move 4…a2! is actually a tempo move – a feature which was omitted in the comments. 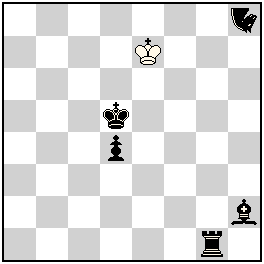 The solution in b), in spite of the repeated move Kb6-a5[+wPb6] has an entirely different end: both sides promote their pawns into Rooks, but the only way to actually force the mate is not 5.Rh3[+bPb3] because it guards the rebirth square of black Rook. Only 5.Rb5[+bPb3]+ works. Now bR guards e1. Finally, in c) we have a second tempo move 5.e7!, this time played by white, forcing the second zugzwang mate by the promoted Knight. An unbelievable bag of tricks, with truly exquisite play! An outstanding dynamic composition, which received perfect scores both for technical merit and artistic value. First, thanks to Anti-Andernach condition, black pieces are turned to white color. Then, thanks to Take&Make and Anti-Take&Make white pieces are positioned around the black King, while the remaining black piece blocks the remaining flight. To my own knowledge, it is for the first time when these three conditions have been mixed together! 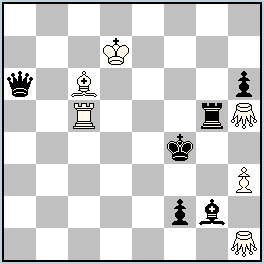 The cyclic exchange of roles between three black pieces – as pointed out by Kjell Widlert – and the ideal mates demonstrate that both the idea and the form are perfect. The initial position, with white Rex Solus and black Rook, Bishop and Nightrider, bought in my mind the problem 302.1, which received the 7th Prize in Julia’s Fairies 2013-I tournament. However, instead of KoBul Kings we have Anti-Take&Make and only one black pawn on the board, but also only two solutions instead of the full cycle. Nevertheless, this Letztform fully deserves the top honours in a very strong competition. 510. Virtual pins in KoBul Kings have been shown before (see G). 531. 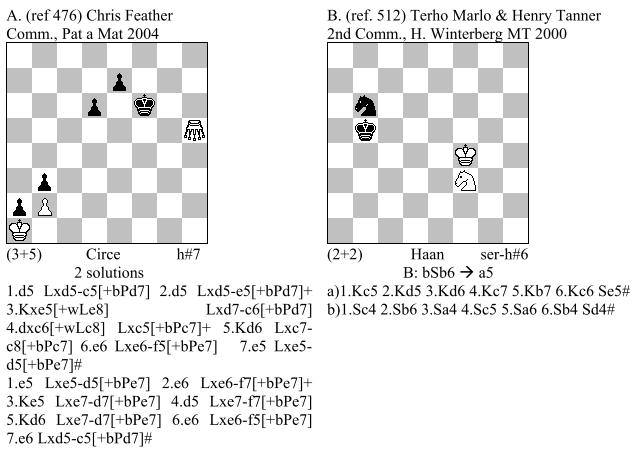 Three pairs of pieces mutually change their functions, but strong similarity with H.
Giving mate to a neutral King with only neutral pieces has been shown before, but I think it is the first time to see this idea realized in helpselfmate with Duplex. There are not many Take&Make effects obscuring the contents and the same nB and nS get captured in both phases. It is particularly appealing to see nPg5 giving twice check and twice mate from all four possible directions. The creativity of this talented Russian composer must be praised. The three duos in Meredith setting (one being passive) are nicely complemented by the active sacrifices of both white and black pieces. There was a passionate debate in the comments: is the usage of Madrasi well justified? One must carefully assess what is preserved and what is lost. From a purely economy perspective, the black Queen is replaced by a black Pawn and the density of Take&Make effects is increased from 40% to 50%. 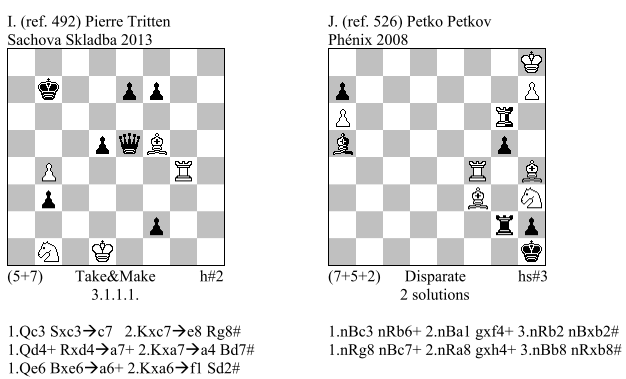 The main intended features (3 duos, active sacrifices and diagonal-orthogonal correspondence) are all preserved, but one: paralysis is broken twice and subsequently reestablished, which is replaced by pin-mate obtained after the initial anti-Ziel interception of the future pin line. But once you study in deeper detail why, you will soon discover that in 507 the motivation of the white interception is justified by the need to release the paralysis and related to the whole mechanism, in the shorter version it is rather incidental, with the attempt 1.Rf5 being refuted by a specific virtual Take&Make effect, but not having its correspondent try on the diagonal. On a side note, the usage of Madrasi in F507 gives black an additional opportunity to parry the check, but 3.Rg5xBd5?? can’t reach on the first line, while 3.Bg2xRd5b5 is thwarted off by the clever presence of wKd7. Of course, the presence of such a Madrasi and Take&Make effect would have significantly enhanced the overall value of the composition. A typical solver’s problem! 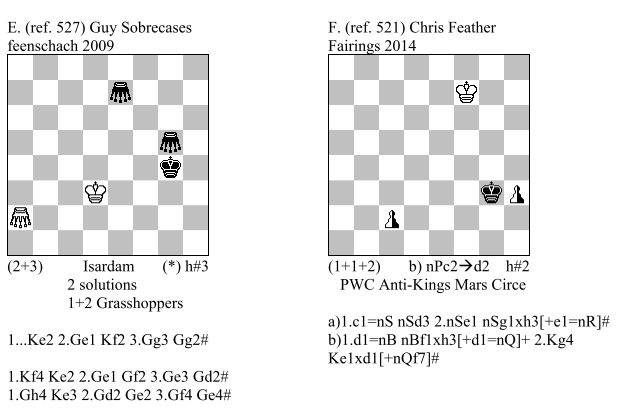 Neal’s SAT selfmates with Royal Grasshoppers are always both intriguing and fascinating, featuring the ‚bag of tricks’ chess composition style. 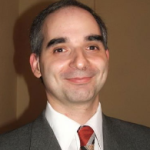 His article, finally published in feenschach, throws a light on the various ideas that can be shown using this material. Here we have an unexpected feast: one difficult threat plus three interesting variations – quite surprising taking into account the initial blocked position. Every single piece performs several duties, thus enhancing the overall value of the whole mechanism. Wow! This charming presentation of cyclic Zilahi, with black Queen active sacrifices and Take&Make effects exploited by both sides ending in model mates significantly improves the economy compared with Pierre’s previous realization of the same theme (see I). However, this case also raises an ethical dilemma for any judge: should a problem be banned from receiving rewards due to a previous inferior version competing in another informal tournament? To avoid such issues, it would have certainly been better to publish the version in the same source where the original appeared. 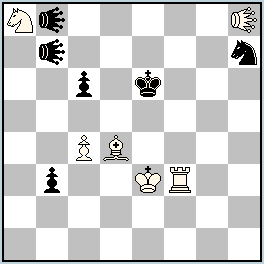 a) 1.nRg4-g8! nBh6-f4 +! 2.nRg8-a8!! nBf4-b8!! b) 1.nBh6-g7! nRg4- g2 +! 2.nBg7 – a1!! nRg2-b2!! 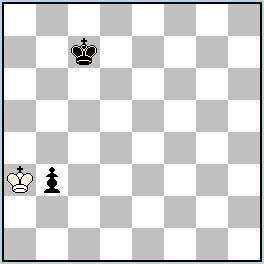 An appealing way to deliver mate is by patrolling the piece attacking the black King. This is done twice, with a neat change of roles not only between the light white figures, but also between the two Rooks. The key contains a paradoxical anti-Ziel element: B1 removes the patrolling power of the white officer which becomes subsequently patrolled again in W2. The model mates enhance the artistic score. Hope this composition will become widely quoted as it clearly explains what fairy chess composition is all about. The Indian theme is doubled in a Meredith setting, featuring impressive and highly convincing display of Disparate effects, including the virtual ones displayed in the tries. I fully agree and support the general view that the dual avoidance enriches the content of the problem, as extensively discussed in the comments. Why this exceptional composition receives such a low ranking?! Let’s first study problem J. 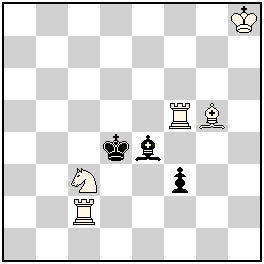 Although there is no Indian theme, 2/3 of the solutions are very similar, with neutral the pieces getting in the corners and subsequently blocked. The main difference, though, is that in 526 we have a battery play instead of the zugzwang finish, which allowed the author to remove 4 pieces from the board. In spite of the entirely different final, which is clearly a sign of striking originality and profound conception, we must also admit there is a strong relationship between these problems. I eventually reached at the same conclusion as in the case of the 3rd Commendation: 526 would have been better published as an improved version of the 2008 composition originally appearing in Phénix. However, the rather low ranking does not diminish in any way the intrinsic value of this superb composition! Here we see again a clear-cut and original presentation of two duos, with an excellent density of Take&Make specific effects. The full creation of the white royal anti-battery and the cross-checks create an impression of fireworks. However I have the feeling the first move is somehow disconnected with the rest of the contents. An interesting question was raised in the extensive comments: is it preferable to have a shorter presentation? The economy principle would generally suggest a positive answer, but of course it depends on the particular context. In this case, I think the composer’s choices (or shall we better call them trade-offs?!) are justified, taking into consideration the slight unbalances from a purely artistic point of view (e.g. 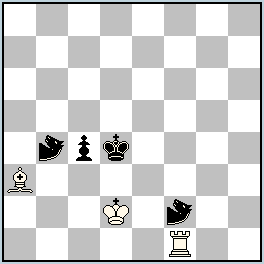 the black Queen mates twice on line, diminishing the diagonal-orthogonal correspondence). Helpmates in ABC Chess seem a little bit counter-intuitive at the first glance: can one really speak about “help” play, when the piece to be moved is already known? Where is the interest of such compositions? The Swedish master convincingly shows that good thematic (corner-to-corner walks by both Kings) can be mixed with good inter-play in the long, subtle and unique solution. I hope this seductive problem will find its place in the anthologies of the genre for its clear-cut idea, probably shown for the first time. The article “Creation of hs#s for WCCT in cooperation” instructively explains a systematic way of chess problem composition. On a personal note, I feel there is missing a third part of the article explaining how to perform the choice of the final version among several sound attempts. This part would have definitely helped the less experienced composers who are unable to decide when they should stop doing improvements. 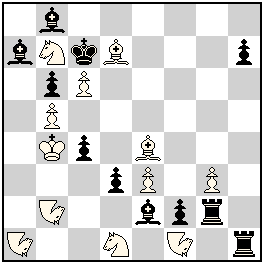 My personal preference goes to this version for the following reasons: the active role of all fairy pieces in both phases, the economy of moves and material (I failed to see the value of the additional wLE move in JL-14) and the superior aesthetic of the position, with two corner-to-corner moves in each solution. A fresh and original idea: black annihilates a neutral piece which could serve as a stepping-stone in order to parry specifically Take&Make the double check! Respecting the new German logic school standards, the purity of aim is preserved thanks to the initial selfblocks on the flights guarded by the neutral Bishops and the return of the other neutral Bishop on its original square. 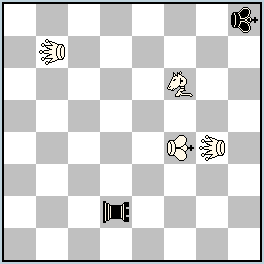 This highly paradoxical introductive play leads to the denouement where the neutral Giraffe and the neutral Knight will deliver mate on the square occupied initially by the other piece. The same authors have published in the same year several compositions where the neutral rider reaches on its final square after bQ sacrifices, in a more convincing demonstration of the possibilities of this mechanism (see K). 1.Na4? [2.Ne6#] is refuted by 1…Rh6! and 1…Bg4! 1.Nxc4? [2.Ne8#] is refuted by 1…Rh4! and 1…Bh5! 1.Sc3? [2.Sd5#] is refuted by 1…Rh5! and 1…Bf3! 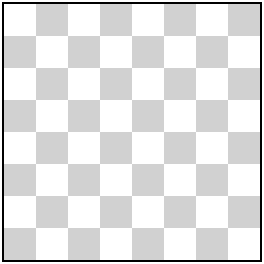 The black lines intersect on three different squares: e4, f5 and g6. 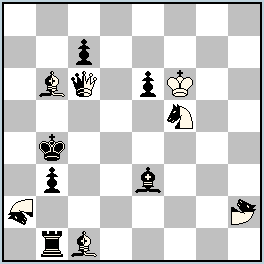 Once the black Rook and black Bishop are decoyed from their main defensive lines h1-h6 and e2-h5, based on the line closings provided by the white Bishop, only one of the three white attacks will work on the second move. Does the presentation of a theme shown several times in orthodox form deserve a high distinction in a fairy tournament? Though the mechanism is mainly based on solely orthodox effects, it is shown with an unequalled crystal-clear logic. I decided to reward the logic presentation, in spite of some formal drawbacks like the technically underused white Nightriders. 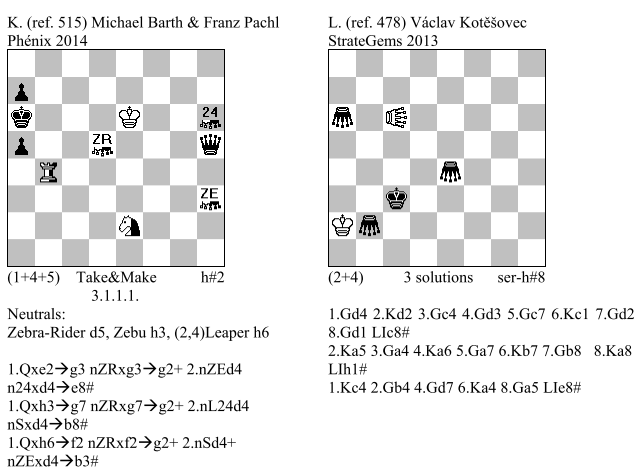 A demonstration of technical virtuosity: three long solutions ending in typical Czecho-mates, with full activity of all black pieces. 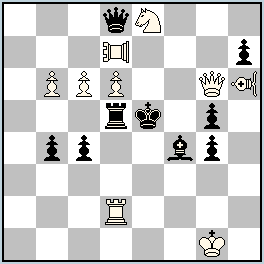 Moreover, no move is actually repeated during the play, as two different black Grasshoppers are moving to e7. It is also particularly pleasing that all black pieces are Grasshoppers and all of them are used in the solutions. The extensive research the author has performed in the past years in this area has lead to an impressive outcome. 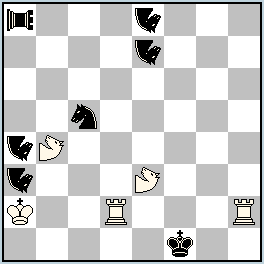 The only very small blemish is that white pieces are not actively involved during the black play (see for instance L). 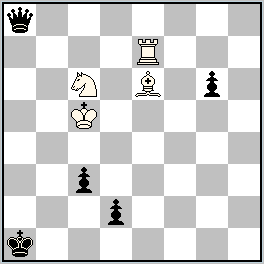 This extraordinary achievement must be highly praised and recognized, regardless how it was created, at least for the following reasons: it is for the first time when a (5, 5) echo is obtained in a serial helpmate without twinning shifting the black King’s position by twinning and it is the single composition using the force (white Vao – black Grasshoppers) ending in a triple echo. The top 3 places are awarded to original combination of fairy ideas, scoring very high both at the technical merit and the artistic impression. The quality of these compositions is so good, that any of them would have certainly won the top place in another tournament. I. 1…Ne7-a5=w! 2.NAb4-h1=b Na3-b1=w!! 3.Rh2xh1 + Na4-g1=w #! II. 1…Ne8-a6=w! 2.NAe3-d1=b Na4-b2=w!! 3.Rd2xd1 + Na3-e1=w #! The full cycle of exchange of functions between three black pieces is by far the most ambitious theme from the tournament! Luckily enough, it is not “one in a thousand” – we had to wait for only 500 published compositions to see this opus. It is interesting to see the “Make” part of W1 is replicated in B2: 1…Nxc6-c3 (a) corresponds to 2.Rc6-c3=w (b), while 1…Bxb1-h4 (b) corresponds to 2.Nb1-h4=w (c). 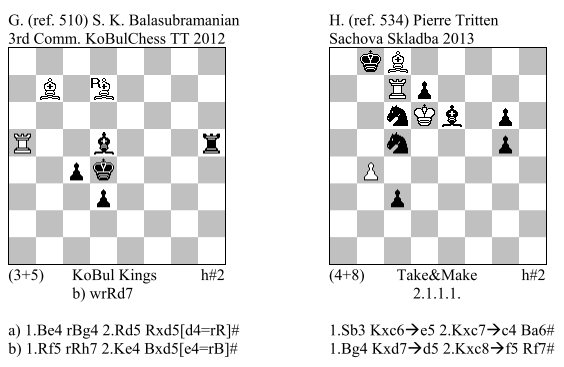 Alas, there is no more a third correspondence, as 1…Rxf7-d5 (c) doesn’t match to 2.Bf7-e8 (a). Otherwise, the whole conception is impressive, with an extensive usage of all fairy pieces and conditions. The twins are perfectly acceptable, with wNg7 shifting in the last twin allowing the appearance of the third model mate. It takes a lot of time, patience and perseverance to understand how to make progress from a two-phased to a three-phased form. The authors deserve credit for not rushing to publish their very first realization of the complete cyclic pattern, but looking for any possible improvements. A top class artistic piece of work, which will hopefully become widely quoted. The short, but intensive, solutions show four duos composed of pieces of the same type, out of which one (bNa3, bNa4) is active and three (bNe7, bNe8), (wNAe3, wNAb4) and (wRd2, wRh2) are half-active. The strategy effectively exploits both fairy conditions: black battery transformation, active wNA sacrifices and active bN selfblocks compensating for the unguards. The [anti-]battery mates exploit the temporary paralysis of three white Nightriders and white Nao block – a deep and original fairy motivation. In spite of the amazing economy (aristocratic Meredith! ), there is also a minus which might have escaped the author’s vigilant eye: the lack of interplay. 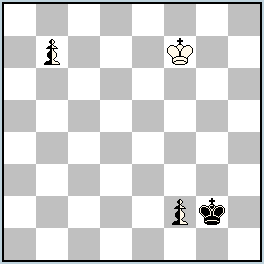 However, the scheme seems entirely new and is original, although the Disparate paralysis of four white pieces has been already shown before (see M). As usual with Petko, the technical execution is extremely impressive. This splendid Meredith subtly exploits a property of the employed fairy piece and condition, namely the non-capturability of Locusts in Take&Make. 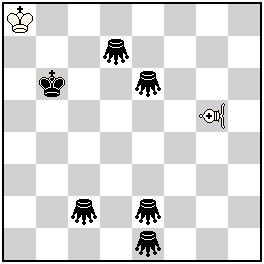 The main theme of the problem is presented in the critical position: white Locust captures a black piece and checks black King supported by a white officer specifically pinned by a black Locust. Black can only defend by capturing the supporting white officer with another Locust and “making” it into a pin. The whole play is enhanced by the active Knight sacrifices by both sides. Although bLb7 and bLb8 respectively capture wBd4 and wRf3, the alternation between active and passive sacrifice increase the dynamism of the solutions. The order of moves is cleverly forced, although the actual motivations are rather heterogeneous. The non-homogeneous additional effects, such as the square vacation of B1 in the second solution, constitute embellishments and must not be judged as defects. An excellent composition, definitely worth the first prize! In the end, I would like to thank all the participants, composers and commentators, for their involvement in the success of this tournament and congratulate the winners! Congrats Bala on winning against such tough competition! Very nice problems overall! Congrats to both 1st Prizewinners ! Great problems ! I had to work very hard to get this prize winning version. This is actually the 20th version of the original idea.